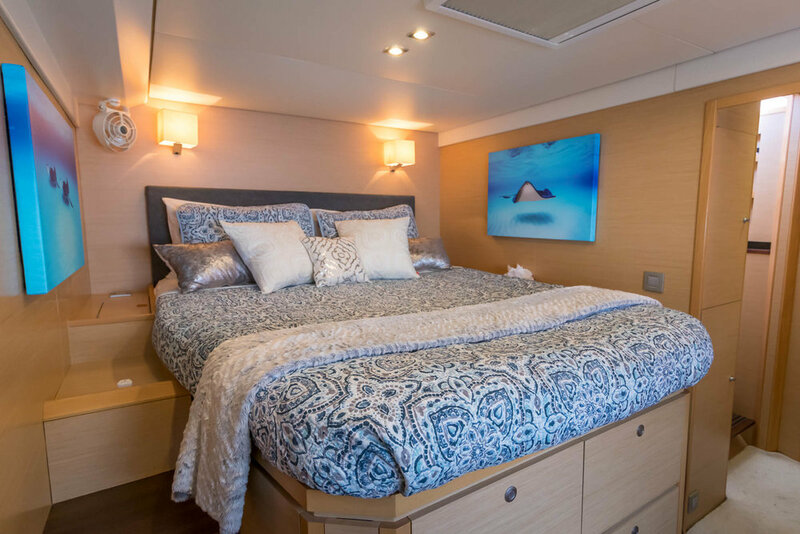 Foxy Lady, a first class Lagoon 620 catamaran, is available for charter in the Caribbean and is based in the British Virgin Islands, providing luxury accommodation for 8 guests, with full board and an open bar. 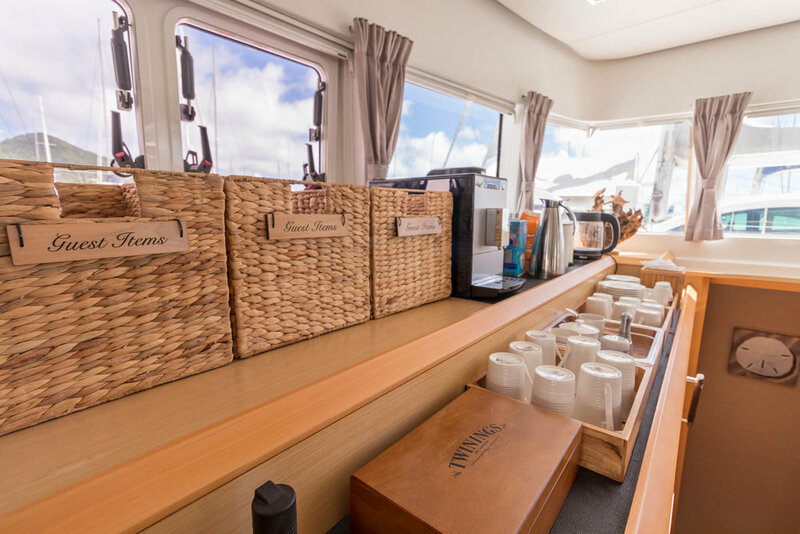 Come and experience the lifestyle offered in this stunning part of the world, aboard this popular sailing catamaran. Join us on Foxy Lady to discover perfect bays and secret spots, adventure where privateers and pirates once roamed and sail downwind with the sun on your face and drink in your hand. Sit back and soak up the sun on one of Foxy Lady's many couches and sun beds, or take a well deserved nap in your fully air conditioned cabin. 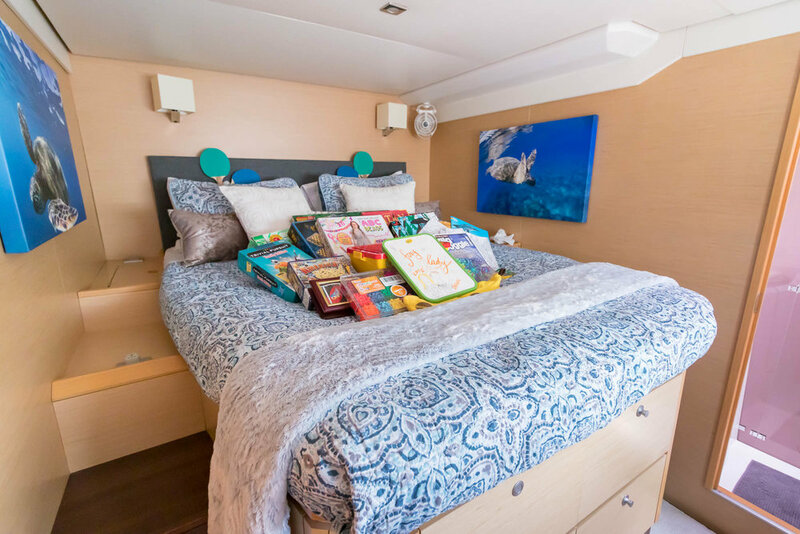 Snorkel or dive a sunken wreak, tropical reef or in the sandy shallows right off the beach or the back of Foxy Lady, and afterwards enjoy a refreshing shower on deck. Join in for themed nights, cocktail parties, children games, sundowner treats and delicious 3 course meals. 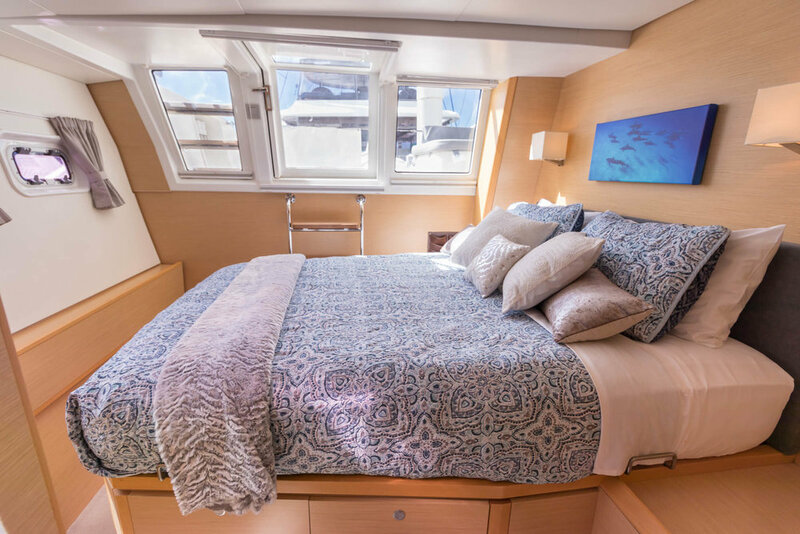 Get involved in the sailing of Foxy Lady with the enthusiastic advice given by your captain. 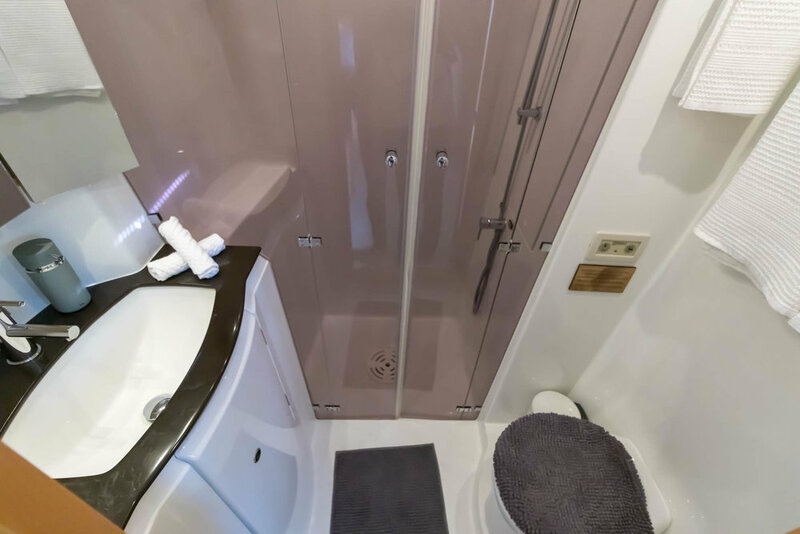 Watch as your children enjoying a thrilling ride on the tube behind our brand new tender, or play hide and go seek on the best floating toy ever! See them take an interest in the fascinating underwater world or learn first hand why the ocean glows at night. How would you like to be guaranteed to catch (and release) a fish off the back of Foxy Lady at night, or partake in a amazing night swim to view the fish and stingrays attracted by Foxy Lady's underwater lights? Star Gazing and stories up on the Sky Lounge with treats or a romanic after dinner set up with fluffy blankets, pillows, soft music and lots of lanterns. Come and experience the art of living... Choose this winning combination of yacht and crew, and your are in the best possible hands for the vacation of a life time. Many of you will know of the devastation that the British Virgins Islands and countless other islands suffered at the hands of hurricanes IRMA and MARIA, but Foxy Lady is 100% and the Islands and bays are still here, and her crew are ready to show them to you. To share a quote from a local, 'our beaches are still beautiful, our seas are still blue, our drinks are still cold'. 3 Queen size cabins each with individual a.c. controls, en suite bathrooms, and electric toilets. 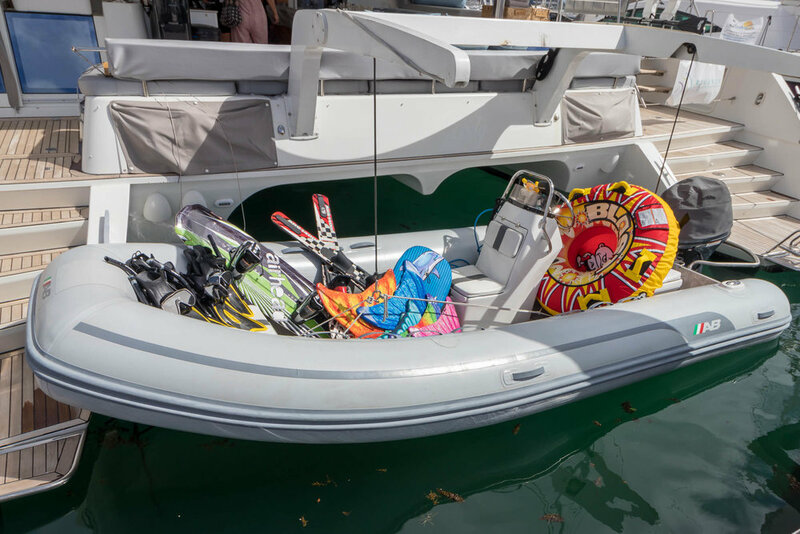 15’ Dinghy with a 70HP motor which can pull wakeboard, kneeboard, water skis and tube. Dingy also has underwater lights for fishing! 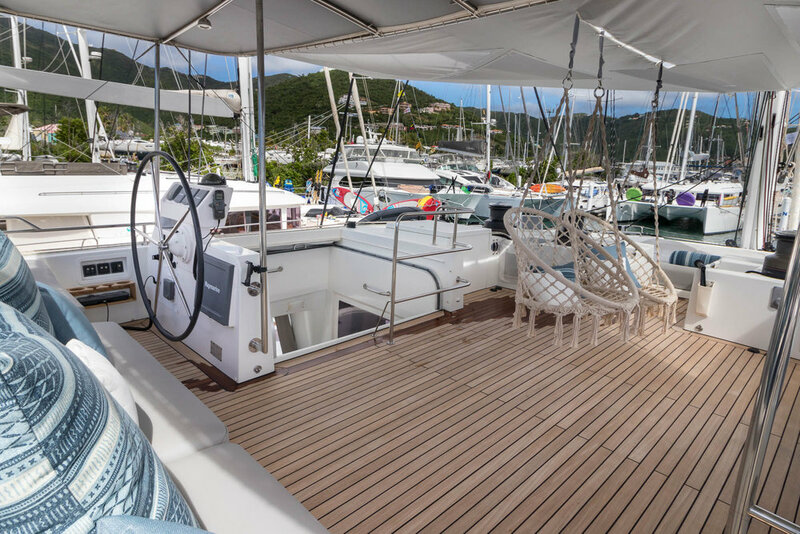 Foxy Lady is offering a AUGUST SPECIAL IN GRENADINES/GRENADA. All Inclusive up to 8 passengers: $29,800!